Lights went out at the State Department, White House, Capitol and many other places in Washington, DC, in a puzzling series of power outages. Terrorism is not suspected, officials say. 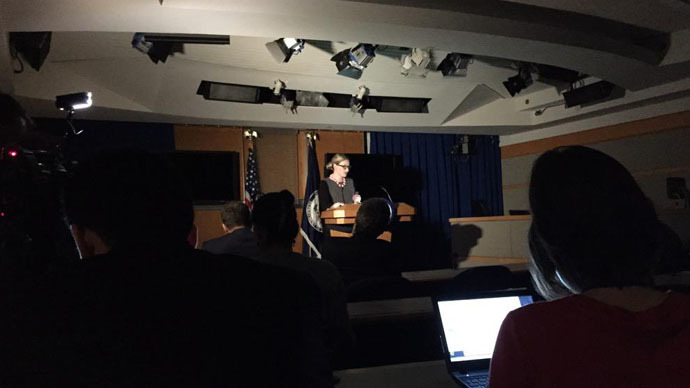 Power went out at the State Department during the question-and-answer session on Iran nuclear talks. After the initial confusion, the briefing continued. Acting State Department spokeswoman, Marie Harf, continued the session under what appeared to be light from a smartphone. Outage at State seemed to be part of a widespread chain of power failures around Washington, DC, for “unknown” reasons. Reports are coming in from a number of government buildings, metro stations and offices downtown, including the White House and the Department of Justice. The subway serving the Dirksen and Hart #Senate office buildings is temporarily out of service. The walkway remains open. Washington Metropolitan Area Transit Authority (WMATA) reported 13 stations on emergency power. Metrorail counts 13 stations on backup power. Locations widespread, including Anacostia, Dupont, Minn Ave, Pr George's Plaza, Navy Yd. Several office buildings downtown have been evacuated. The University of Maryland, in the suburb of College Park, also lost power. There is a campus-wide power outage. Crews are working on addressing the problem. Thank you for your patience. Smithsonian Institution museums downtown were also affected. Four museums were evacuated, including the popular National Air and Space Museum. Potomac Electric Power Company (Pepco) has not officially confirmed the cause of the outage, but said that by 1:15 PM local time there were 111 active outages and 2,467 affected customers. According to Washington Post reporter Aaron C. Davis, Homeland Security officials believe the cause of the outage was due to an "explosion" at a Southern Maryland Electric Cooperative (SMECO) power facility in southern Maryland. US government officials told Reuters there were "no initial indications" terrorism was involved. "We experienced a dip in voltage in the Washington, DC area. This was caused by an issue with a transmission line. There was never a loss of permanent supply of electricity to customers," Pepco said in a statement on Tuesday afternoon, as power began to return to the US capital.